The graph below plots team defensive SR by team offensive SR. The vertical axis is defense, and the horizontal axis is offense. The red lines indicate the league averages. Teams along the diagonal running from the bottom left to the top right are balanced between offensive success and defensive success. Teams far from that diagonal are unbalanced. In the upper left we'd find teams with good defenses but poor offenses, and in the bottom right, we'd find teams with good offenses but poor defenses. This graph is one of the reasons I'm high on GB, I'm suspicious of ATL and CHI, and I think NE might be vulnerable. SEA is close to an average team in some regards, particularly when Hasselbeck is playing and not Whitehurst. Keep in mind SR is not everything. Some offenses are "big play" offenses, and both PIT and BLT qualify. Roethlisberger and Flacco throw deep on greater than 24% of their attempts. They are built by design not to have very high SRs. And as I mentioned yesterday, NE's defense might be the reverse--designed to allow lots of short successes while rarely giving up the big play. "Unlike passing and running SR, which correlate to a fair degree, there is no reason to expect team offense and team defense to correlate." Actually, I think the salary cap implies a negative correlation. With running vs passing, positive correlation makes sense because great offensive players help both. This could be directly (linemen) or indirectly by shifting the focus of the D (QB, receivers). With O and D you don't get a similar effect* and having great players on one side means you are likely not as good on the other because there is less money to spend. This might be mitigated by some factors like coaching and front office differences helping or hurting you on both sides of the ball, but IMO a negative correlation makes more sense than zero. Without the actual numbers, this appears to be supported by the scatter plot. There are 5 teams just off either axis, 11 teams in the Southwest or Northeast quadrants (corresponding to positive correlation) and 16 teams in the Northwest/Southeast. Also, the points all seem pretty close together with the exception of IND, HST, NO and NE which are in the negative-correlation direction. * you could with total stats due to controlling the ball but I don't see why with rate stats. Good point, Jared. I'll check that out. 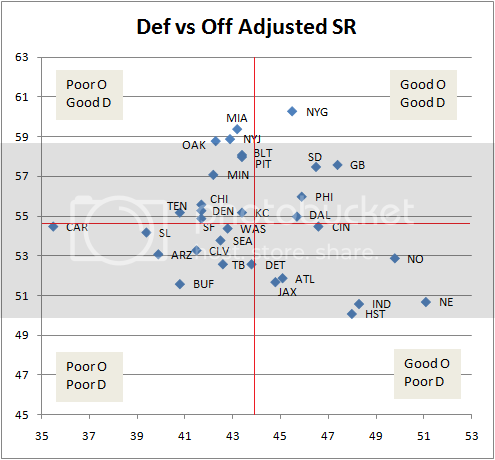 The correlation seems to make sense for at least two reasons; defenses seem to tire more toward the end of games, and offenses that are behind in games seem to become more one dimensional. So if your offense is more successful, you keep your defense fresher later. You also potentially build a lead, making your defense's job more easy as they know what to expect from the opposing offense. Do you think first half offensive success rate leads to second half defensive success rate?